Today was a short pratice. We have 7 huge games coming up in a row (minus the rainout day in the middle). Also, today we saw blue sky for the first time since we have been in Beijing, it was nice to see, but the temperature went up about 4 degrees... so for now, I'm not too unhappy about the smog. http://os2008.nos.nl/index/live , or go to www. NBC.com and follow the links to watching the olympic events live, supposedly they are showing every event online. TJ (catcher) and I with some time on the bus. I figured out some different settings on the camera, so I decided to get him in on a trial run of a new colour setting. This IS our closer. But a sad story to him this trip. Loek was warming up in the bullpen in a practice the day before the opening ceremonies and tore a ligament in his elbow. It was horrible news for us, and obviously worse for him. The coaches had to make a quick decision to fill his spot on the roster, and picked up national team veteran Dave Draijer. 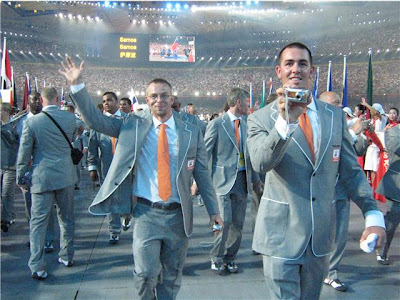 Loek was able to participate in the opening ceremonies, and was even ushered to the front of the Netherlands team parade by our "Chief de mission". He took the news hard at first, but reacted better than anyone would have thought. He left the team 2 days later in a positive and very classy manner. Good luck in your rehab back in Minnesota Loek. 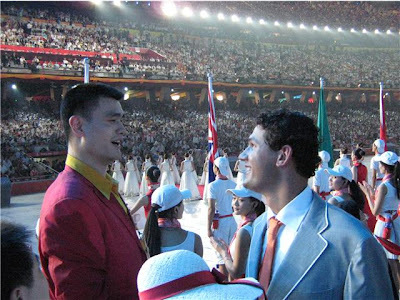 If you watched the opening ceremony you would have seen all these guys. We drove by about 120 of these trucks in a row filled with about 18 year old chinese boys. All the same size kids and everything. We later realized they were the ones who were the catalyst in the opening ceremonies. Pics are great Leon, keep em coming, we love the "inside" look. The nos.nl link by the way can only be accessed from a Dutch internet connection,...tough luck for those of us who live outside the Dutch geographical boundries. All the best to you and the whole team, especially to Loek for a speedy recovery! Leon, thank you very much for the pictures of Loek and your comments. I wish you and the other guys of your team great games with lots of succes! You can do it, so go for it!